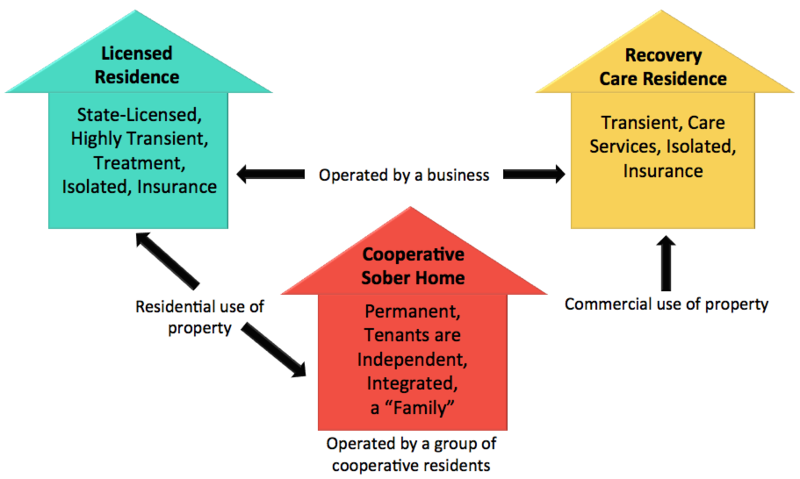 From a city's perspective, there are three types of housing that may be operating within its jurisdiction: Licensed Residences or detoxes, unlicensed Recovery Care Residences, and Cooperative Sober Homes. Licensed Residence - In California, this is a house where “social model,” “non-medical,” “treatment” services are offered, most often licensed for Detox, but occasionally licensed for more mental health recovery services like talk therapy. “Treatment” services can include pill distribution, counseling, and regular monitoring of occupants. Any house providing “Treatment" is REQUIRED BY LAW TO BE LICENSED in California. California law additionally allows “Incidental Medical Services” to be offered in houses offering “social model” treatment. Occupants typically stay in these houses for 6 to 30 days with reimbursement from private health insurance providers. While clearly a transient, commercial use of a residential property, in which the operator is in control of the house, these houses are exempted from municipal interference by California State Health Code declaring them a “residential use” of property. Recovery Care Residence - While these houses are technically not allowed to provide treatment, they still provide many other commercial services--some unnecessary to the recovery process--including grocery provision, meal preparation, transportation to and from treatment and activities, pickup and delivery of medication, scheduling events in which the residents participate each week, and a paid staff member on the premises to supervise occupants. The residence is operated as an institution. Transient occupants are not encouraged to get a job or integrate with the community because they are not considered far enough along in their recovery to engage in these activities. Occupants contract with the TC for housing and do not see the property or neighborhood in advance. Fitness centers, public parks and local AA meetings are exploited as inexpensive, group activities. This is clearly a commercial use of the property, in which housing and services are provided in exchange for compensation. ​The lifeblood of an Addiction Treatment Center business is the pipeline of recovery: Licensed Detox-->Recovery Care Residence-->Cooperative Sober Home. Treatment Centers want to "own" their own licensed Detox or Detoxes, and then move clients into Recovery Residences. If treatment is restricted solely to the Treatment Center, Recovery Care Residences can claim to be Cooperative Sober Homes and a residential use of property and fly beneath the radar of regulation. In Orange County, a single Detox will average approximately 2 weeks of stay for 6 clients. If all of the clients were to remain with the same business through multiple phases of treatment, the Treatment Center would need to provide for up to between 8 and 10 weeks of housing on a subsequent property, sticking to 6 per property if operating legally, treating a total of 24 to 42 clients between 4 and 7 unlicensed properties. Thus, each licensed Detox spawns demand for up to 7 unlicensed homes. In 2018, San Juan Capistrano, for instance, had 11 licensed Detoxes (+ 3 licensed treatment residences), which suggests demand for Recovery Care properties is 44 to 77 houses. This statistic ignores additional unlicensed houses in which Treatment Centers do not have a financial interest (separate tenancy contract) or for which they operate a licensed Detox in another city, and additional houses committed to Cooperative Sober Homes to which Recovery Resident tenants may move when they are done with recovery. The map to the left shows known and potential recovery residences in San Juan Capistrano. Green flags mark state-licensed recovery residences and detoxes. Red flags mark unlicensed recovery care residences. Yellow flags mark suspected unlicensed residences. Blue flags mark blocks where Sheriff's Blotter events associated with an unknown recovery residence occurred. Costa Mesa calls Recovery Care Residences "Sober Living Homes" in their regulations. The city's regulations aim to benefit the disabled, requiring 650 feet of separation between houses and reducing risk of over-concentration. Dana Point sues individual houses, charging they are operating without a license. In 2018, Laguna Niguel adopted ordinances almost identical to those in Costa Mesa, requiring that Recovery Care Residences maintain 1000 feet of separation. San Clemente has set aside zones for transient housing, barring such uses of property in certain single-family, residential zones. San Juan Capistrano has eliminated short-term rentals entirely. Check out more updates on residential recovery in Orange County's cities! Prescott, Arizona: A Model City? In September of 2013, Prescott, Arizona passed an ordinance that required a 1,200 foot buffer between what they dubbed "structured sober homes." The ordinance also included some parking regulations and a limit of seven unrelated people living in each residence. In March of 2015, the city changed the buffer to 800 feet. In August of the same year, the Department of Housing and Urban Development concluded an investigation on the ordinance, preliminarily suggesting that it did not violate federal law. Eventually, in February of 2017, the Department of Justice released a statement saying that the 800-foot buffer did not violate the Fair Housing Act and had the potential to benefit recovering addicts by mitigating over-concentration of recovery residences.